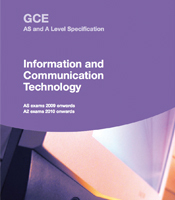 We are not developing a new A-level Information and Communication Technology qualification due to government changes to A-levels. Our regulator Ofqual currently state that, with the exception of re-sits, the last time students will be able to sit exams in ICT will be in summer 2017 (AS level) and summer 2018 (A-level). Re-sits will be available in summer 2019 (AS and A-level), but this will be restricted to students who have previously certificated. As an alternative, you may like to consider A-level Computer Science or one of our Level 3 ICT Tech-levels.